Here it is, folks: another THUNDERous interview with the Rag-NERD-rok Crew! Who is it? Alright, we won’t be CATty: it’s Larry Kenney, the voice behind Lion-O from the original ThunderCats cartoon (among many other things). We talk with him about his career both before and after ThunderCats, how voice acting works and more. Then, Erik regales us all with his adventures at last month’s BronyCon, while Meyer and Alex try not to hate too much. And last but certainly not least, we read all of the new emails we’ve received, as well as the five-star reviews that people have left us on iTunes (thanks for that!). So join us for an episode filled with famous actors, pony talk and you guys! Also, Meyer runs out to get some milk for Ryan’s mom. What a guy. It’s amazing some of the things that you can find when you bid on storage units: antique weathervanes, hubcaps for classic cars and even guys in time machines! We get ready for the big interview, and Meyer graciously agrees to go on a milk run for Ryan’s mom. Larry Kenney. Photo from the ThunderCats Wiki. 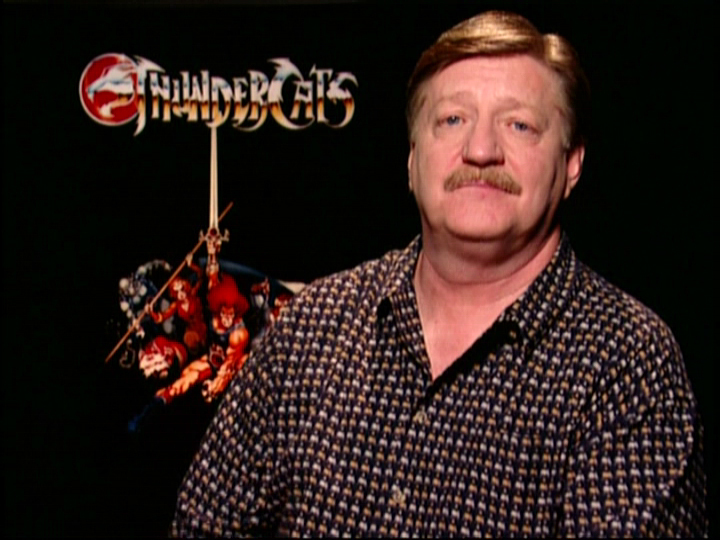 This month’s guest is none other than Larry Kenney, the man who gave voice to one of the best shows from our childhood, ThunderCats. Kenney got his start doing radio in high school in 1963. He made his way through many different stations and eventually wound up working on Imus in the Morning, doing impressions of many different characters and people. In the early 1980s, he was cast as Lion-O in ThunderCats — a role he played for 125 episodes. He was also the voices of Bluegrass and Pokerface in Silverhawks. He has also played the voice of Lion-O’s father in the new Thundercats show, which Warner Bros. rebooted last year. He also worked as the announcer for VH1’s Best Week Ever and was the voice of Count Chocula and Sonny the Cuckoo Bird. We talked with Mr. Kenney about how he got his start in radio and how his career developed. Of course, we talk about his time on ThunderCats and what he thinks of the legacy that he helped create. We also talk about the new show and how it relates to the original. The Graaz: According to Mr. Kenney, Bette Davis says, “Paaz the Graaz, dear,” when she wants to get stoned. Erik talks about his favorite things from this year’s BronyCon, which was held June 30 and July 1 at the Meadowlands Exposition Center. There were 4,000 people who came to New Jersey to show their love of My Little Pony (and you can tell they were serious because they voluntarily went to Jersey). We want to give a big “thank you” to all of our fans. Thank you to the people who left us five-star reviews on iTunes: Mr. PoppinTwist, JoeJRicc, Imadjinn123458765 and Vicky515. Also, a thank you to the people who sent us emails, Bryan K. and Robert P.
Thanks for listening! As usual, we’d love for you to reach out and talk to us (seriously. PLEASE LOVE US!) So feel free to tell us how awesome we are (and we’re pretty awesome. We did just interview Lion-O!). Our email address is info@ragnerdrok.com, our Twitter feed is @ragnerdrok, our Facebook page is www.facebook.com/ragnerdrok, and our voicemail number (516) 362 – NERD . And if you want to have your words read on-air, feel free to leave us a review on iTunes. We’d like to give a special thank you to Larry Kenney for taking the time to talk with us, and to Derek Muterspaw for arranging the interview. Music in this episode was provided by Mike Drazka. If you would like to hear more of his awesome tracks, you can check him out on iTunes here. All tracks are the intellectual property of Mike Drazka, and were used with the permission of the artist. Sound effects courtesy of digifishmusic, tonywhitmore, ERH, reinsamba, j1987 and acclivity of Freesound.org.